President Trump has sent mixed signals about defense spending. The 2018 proposed federal budget calls for a new round of Base Realignment and Closure (BRAC) initiatives — all impacting in 2021. In other statements, President Trump has promised to strengthen U.S. armed forces. Judging from Defense Department reports on military spending by state communities with existing military bases should be concerned about closures as well as about “realignments” even though they may be unpredictable at this point. As Daniel Hummel pointed out in his August PA Times Online column, planning for the unpredictable should be a priority due to the many ways military presence affects host communities. Military spending by the federal government is a powerful economic stimulator. Since the funds are coming from federal tax revenues, they have a multiplier effect on the region in which they are spent. The extent of the multiplier is determined by whether the state has a positive or negative balance of payments with the federal treasury. For instance, the Rockefeller Institute recently documented that New York is a donor state. In 2015, the state paid $48 Billion more in taxes than it received in federal spending. That imbalance was partially offset by the $9.1 Billion in total payroll and contract spending for defense in the State of New York. The relative impact can be measured in terms of the relationship to the gross domestic product (GDP). The State of Virginia received the largest relative boost at 11.2 percent of state GDP. Regardless of the amount, federal spending on payroll for military and civilian on-post employees, on contract workers, and on goods and services delivers a strong financial boost for a community. A Regional Economic Impact study of an upstate New York base, Fort Drum, shows the linkages. Direct federal spending of $1.2 billon generates an additional $387 million in economic activity for a total impact of $1.6 Billion. The most obvious impact is in employment. 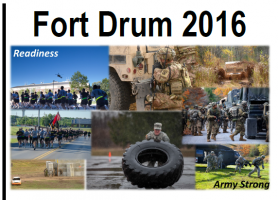 Fort Drum provides 15,000 military jobs plus 4,000 civilian positions. The indirect economic impact creates work for another 6,000 people in upstate New York. Those jobs are stimulated in a variety of sectors with the majority in health, social services and retail trade. Beyond the specific financial impacts, according to a 2016 study by the National Conference of State Legislatures, defense spending affects local government services in many ways that cannot be measured financially. Military bases have the same scope as urban cities: housing, employment, security, social services, mental health, health, public works, utilities and recreation. Some of those services are provided as part of the military base, but others extend beyond the perimeter fences with or without shared services agreements. As a major center of human activity, military bases also provide positive resources for local communities beyond the economic boost. Unfortunately, the same dynamics have a negative effect when military spending is reduced. the number of retired military personnel in the region. Actual impacts were less than the projections. The effects were dependent on the relative sizes of the economic units. External economic factors made a significant difference. These conclusions show the unpredictable character of military spending, even before President Trump. Given the uncertainty, economic development agencies should include contingency planning related to military spending. One element should be potential BRAC impacts. A checklist with the factors listed above might provide a consistent format for measuring any potential impacts. These data can come from economic impact statements from existing bases and from economic models such as the IMPLAN input/out software that was used for the Fort Drum analysis. The resulting contingency plan for military economic resources should be coordinated with joint military-civilian “encroachment” land use planning. Now is the time to predict the unpredictable. When BRAC rumors fly, it is too late. Author: Minch Lewis is an adjunct professor at Syracuse University’s Maxwell School. He served as elected City Auditor in Syracuse, NY, for 9 years. He has developed financial management systems for the affordable housing industry. Lewis earned his master’s degree in Public Administration at the Maxwell School and is a Certified Government Financial Manager. He can be reached at [email protected] .